Summer is in full swing, which means it's time to pick where to go for your fall travel destination so you have somewhere a bit cooler to look forward to. What I'm looking for in a fall getaway is different than the busy beach scene of summer; I'm in search of somewhere quiet, intimate, relaxing and beautiful with plenty of leisurely outdoor experiences that I can enjoy before winter comes and locks me indoors. To help you narrow down your search, I'm bringing you one of my favorite fall trips of all time that exceeded every one of my expectations - here's a look at our visit to South Carolina's Montage Palmetto Bluff, an ideal spot for your upcoming fall journey and the ultimate luxury escape. As I've mentioned before, The South has quickly become one of my favorite US travel destinations and when we decided to go last year, I wanted something away from the major cities scenes to truly relax. 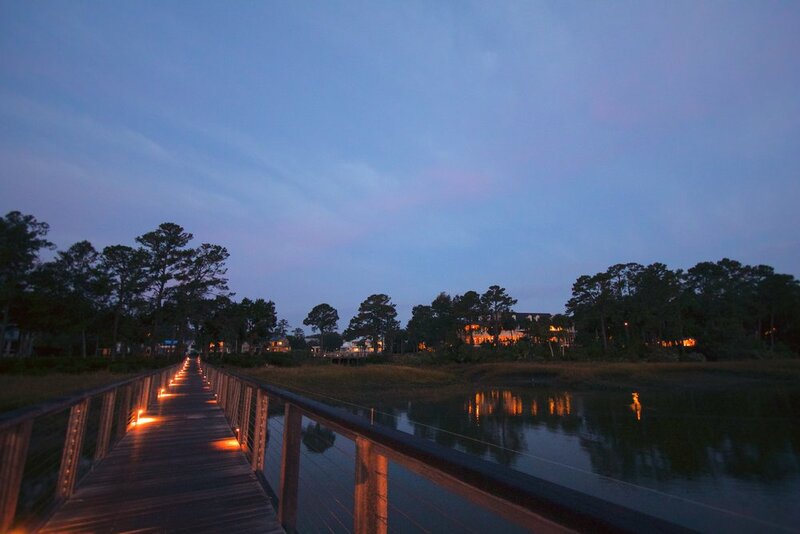 Just thirty minutes from Savannah and two hours south of Charleston, The Montage Palmetto Bluff makes for the perfect romantic getaway and easy to reach by major airports. During our October visit, the weather was ideal (mid to low 70s with low humidity) and I was blown away with every aspect of our stay; from the gorgeous waterfront accommodations, to the expansive property amidst a nature preserve, in addition to the daily resort activities and available equipment so that you have everything you need for a little fun and adventure; it's a destination I'll be convincing my husband to take me to annually. The accommodations are absolutely stunning, with all of the modern luxuries you would expect, plus the little details we all love, like all natural bug spray bottles, water and chocolates at turndown and alligators swimming around outside your back porch (ok, maybe not all of us love that part, but this California girl thought it was pretty exciting!). There are several accommodation options, including guest houses, inn suites and private homes. These are all found at various locations throughout the property, which is wonderful because it makes you feel like you are part of a private community rather than staying at a busy hotel. We often didn't see anyone other than staff for hours at a time and sitting out our back porch, all you could hear were the birds flying by and a light wind blowing through the trees. 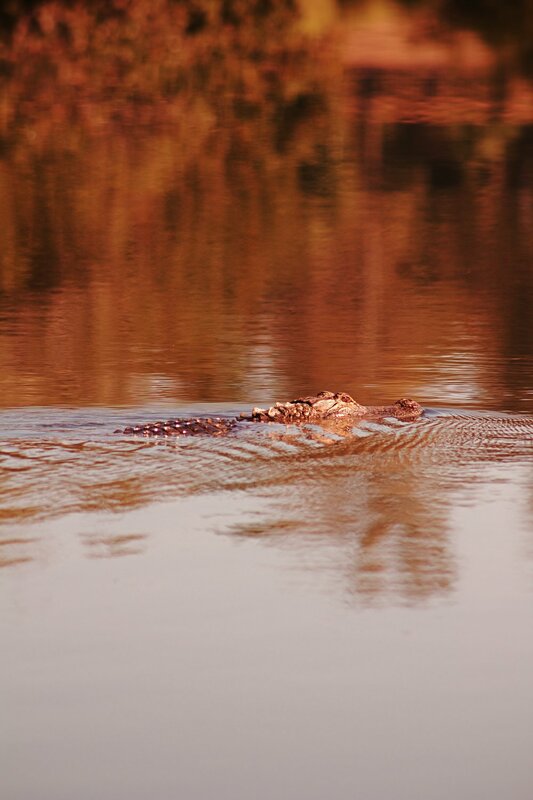 The best part about staying at Montage Palmetto Bluff is their incredible private property that surrounds you and all of the possibilities it brings. 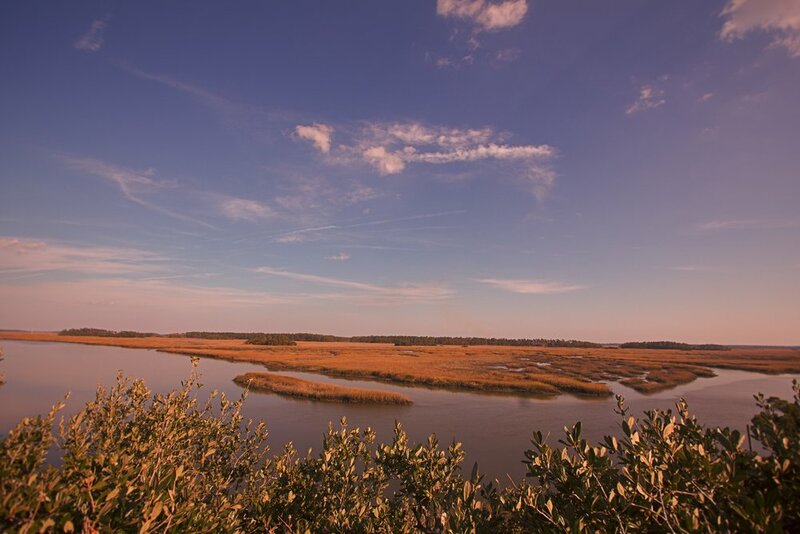 With a lagoon running through one side of the property and the May River on the other, a bird sanctuary right in the middle, a small village with shops and restaurants and miles of trails throughout, it will be difficult to find yourself without anything to do while here. Quick Tip: For just a few dollars a day, you can rent a bike during your entire stay and have it as your main mode of transportation - even at night with its little light placed right on the basket. When you're too tired or tipsy to peddle, just phone the front desk and a golf cart will be right around to take you wherever you want to go and they'll even bring your bike home for you. Now, I'll take you through how we spent our perfect days here, from waking up early to take photos of the sunrise to finishing off our evenings roasting marshmallows over an open fire with an adult beverage in hand. 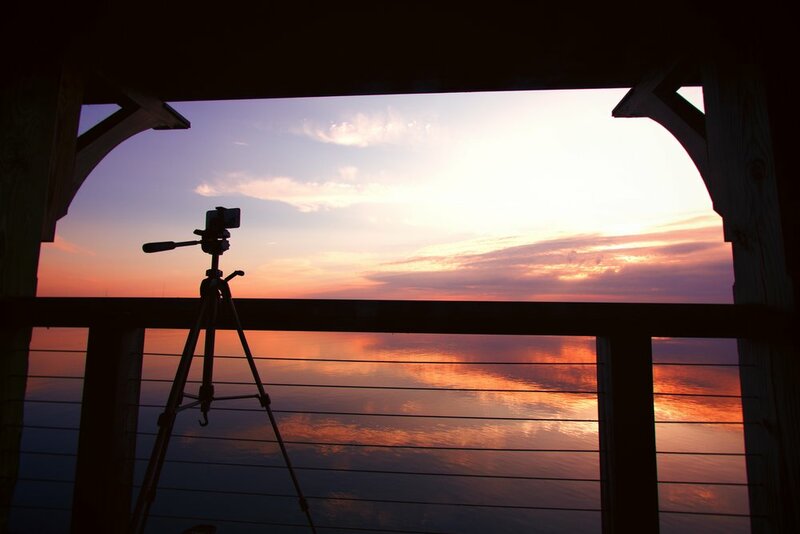 If you're a picture junkie like me, it's all about getting the right shot and there's no better time to capture the beauty of the Lowcountry than right at first light. It's painful when the alarm goes off, but I've never once regretted the forever photos I have when I look back. 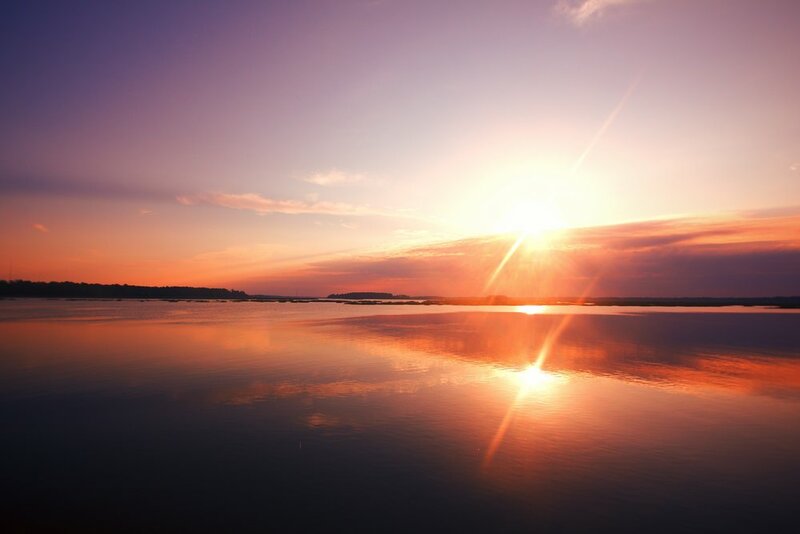 So just before 6am, I load up my bike with all my gear and head over to the river dock for the first hour of the day... if you are paying close attention I said "I" and not "we", Colin most definitely refuses to join me on these little sunrise excursions. 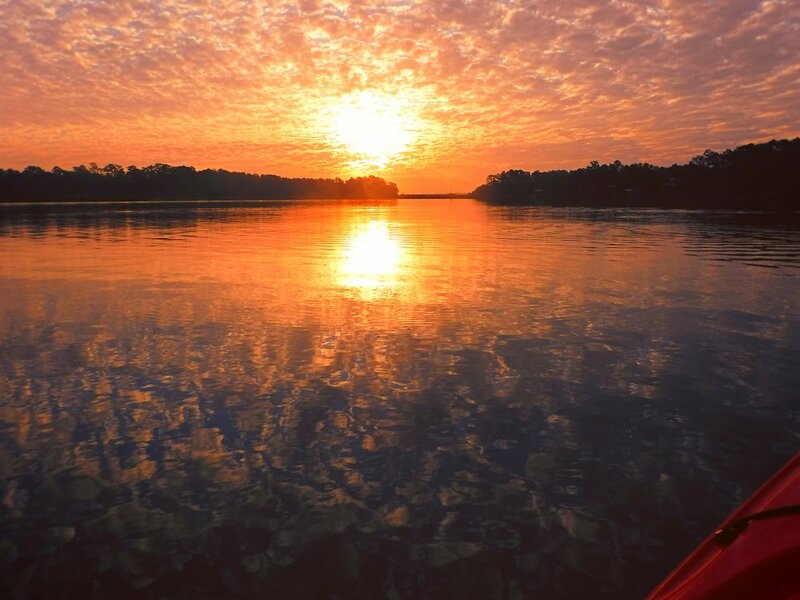 Now that the sky is bright enough for you to see all around, quickly head to the Wilson Landing Dock and jump in a kayak on the May River. 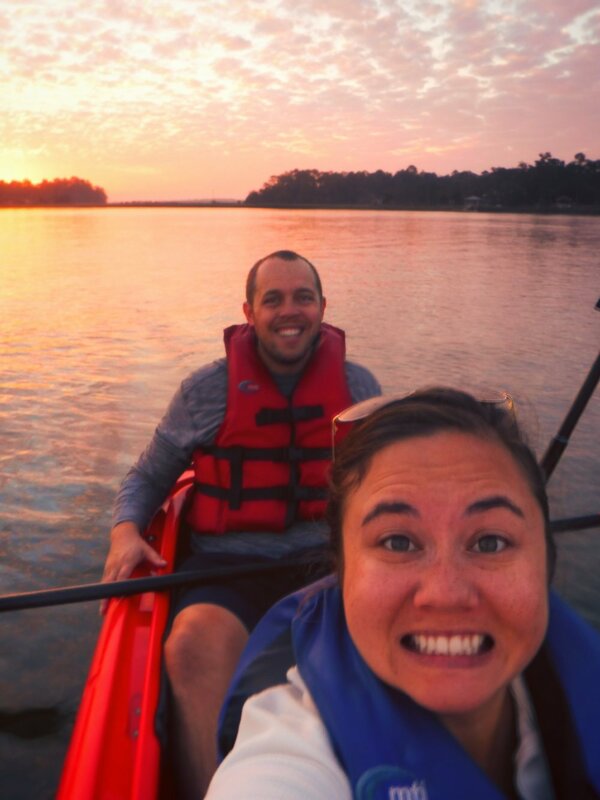 One incredible perk about staying at Palmetto Bluff is that you have so much sporting equipment available and surprisingly the price is included in the resort fee with your stay. 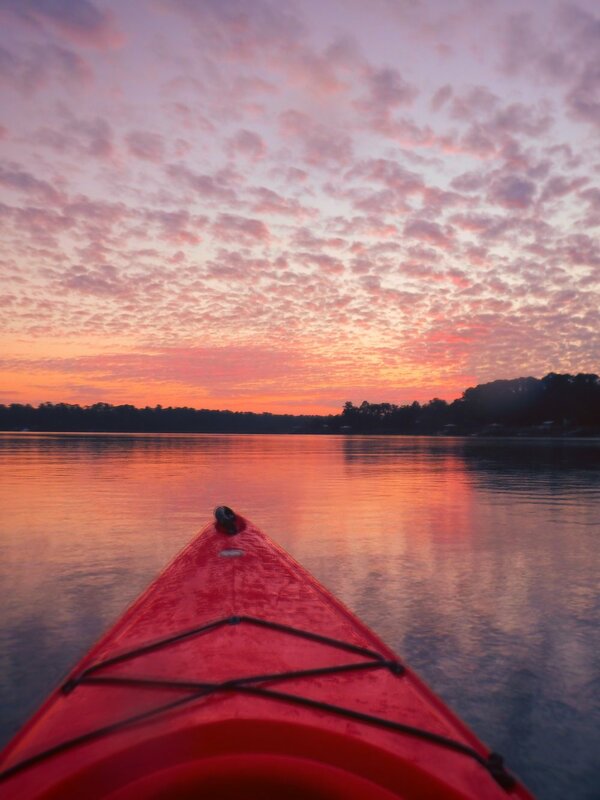 With options like kayaks, paddle boards and even fishing gear, everything you need is right at your fingertips. We headed out early and before anyone else, so we were usually on the water alone to romantically enjoy the remainder of the sunrise. Well, we actually weren't completely alone... did I mention that there are dolphins playfully swimming all around? Oh well, yeah, there's that too - what would paradise be without dolphins? Quick Tip: Pack a dry bag in your suitcase so that you can be on the water with your phone or camera without fear of it getting wet. They also sell them at the Boathouse Boutique if you forget to bring one. After a busy morning, my tummy is rumbling and all I'm thinking about is food! On the way from the dock back towards the cottages, it's best to stop in for a bite to eat before heading to your room. We had breakfast both at Jessamine at the Inn and at Buffalo's and Buffalo's puts out a much better spread, hands down, with a beautiful assortment of both open bar pastries and dishes, as well as regular menu items. We also fell in love with the staff here; their southern hospitality is on point and definitely leaves you smiling for the rest of the day. If you're simply looking for a quick caffeine fix in the morning, you can also head to the Inn where fresh coffee and tea is served each morning. This is often where I would read a book or chat with other guests before making my way to breakfast. 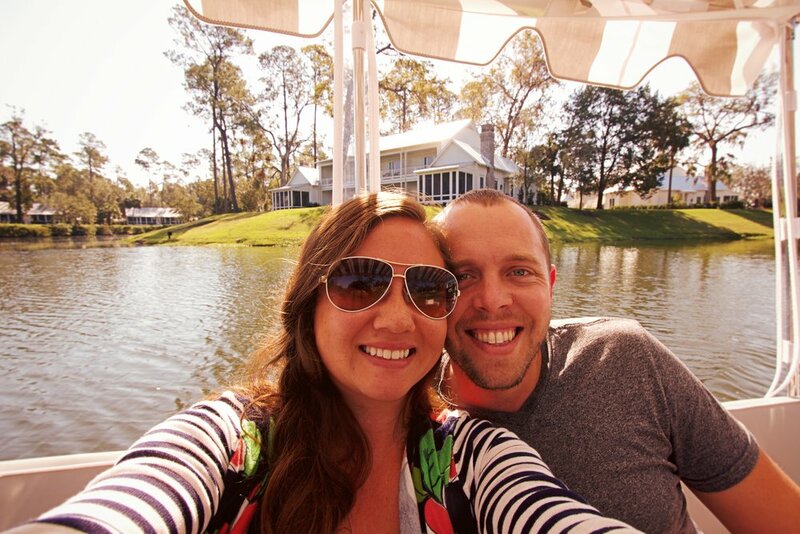 After heading back to our room to freshen up for a bit, we booked a one hour leisurely boat tour of the lagoon. This needs to be booked at least a day in advance and seats about 8, but if you're lucky like we were, you end up on a gorgeous little boat alone with the captain for a private tour of the area. 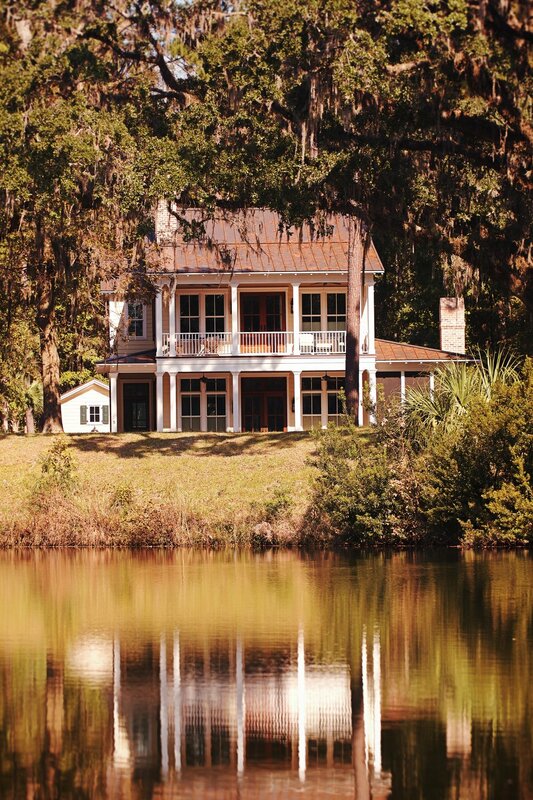 This truly is the best way to see the full extent of the property, gliding under bridges, admiring the stunning homes along the water's edge, watching birds fly by and alligators dip their eyes beneath the surface - it really doesn't get much better. If you're willing to drive out of the property for lunch, I highly highly suggest heading over to Walnuts Cafe in Bluffton. It's a simple, local sandwich shop in a bit of a random spot, but it is so cozy and the food is absolutely scrumptious. If you get a chance, chat with the amazing staff and owner who are both charming and entertaining. It's one of those places that makes you feel like you're home from the moment you walk in - even an obvious outsider like me had no problem fitting in. While I really never want to leave Palmetto Bluff, if I'm being honest, the food is the only let down, so you'll have to work for it if you want something more and Walnuts is worth the trip. 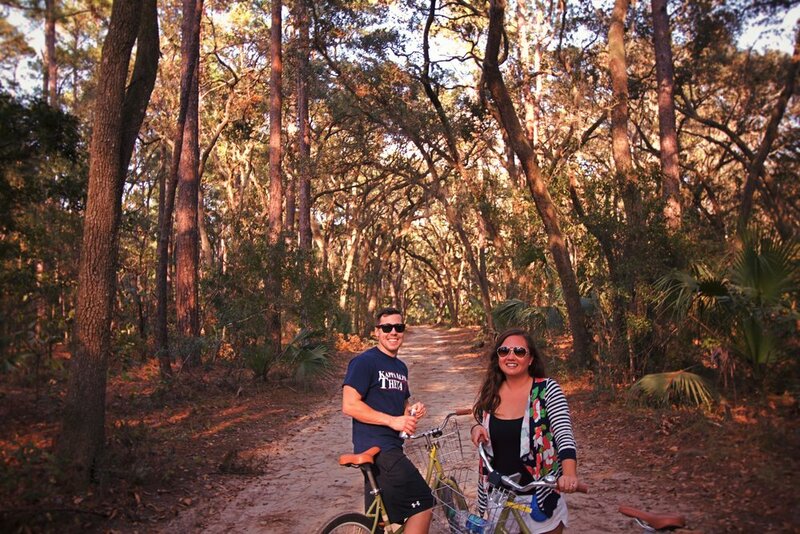 There are an endless amount of trails to explore and you can walk or bike for miles and miles before seeing it all. We enjoyed packing a few snacks and a book in our baskets and sometimes our fishing gear, and heading out in the early afternoon while it was warm and sunny out. The activities staff can provide you with maps and recommendations on where to go depending on your level of energy and adventure. One of the days we found our way to the far end of the property where a massive treehouse has been built (think 4ish stories high!). 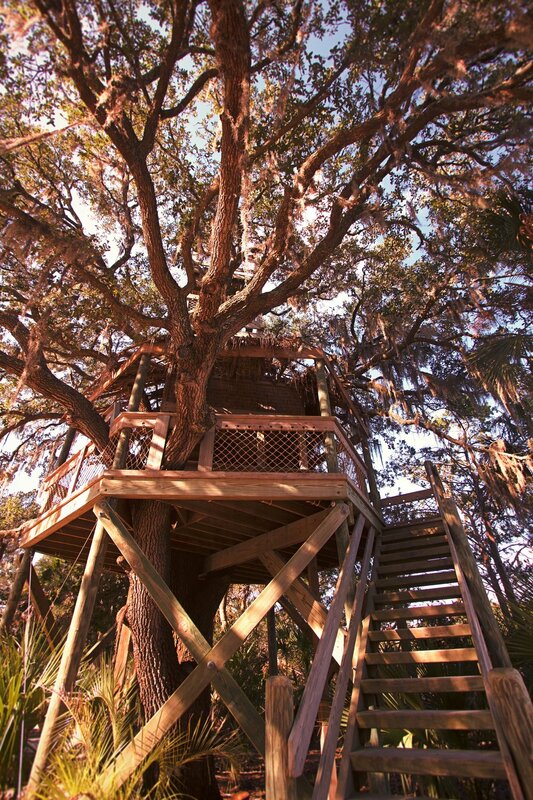 From the top you can look out over the preserve and see just how far you've gone. Quick Tip: Bring bug spray! The hotel provides you with some, but mosquitos can be brutal depending on the time of day and where you are, so it's better to pack some with you - you will need it! 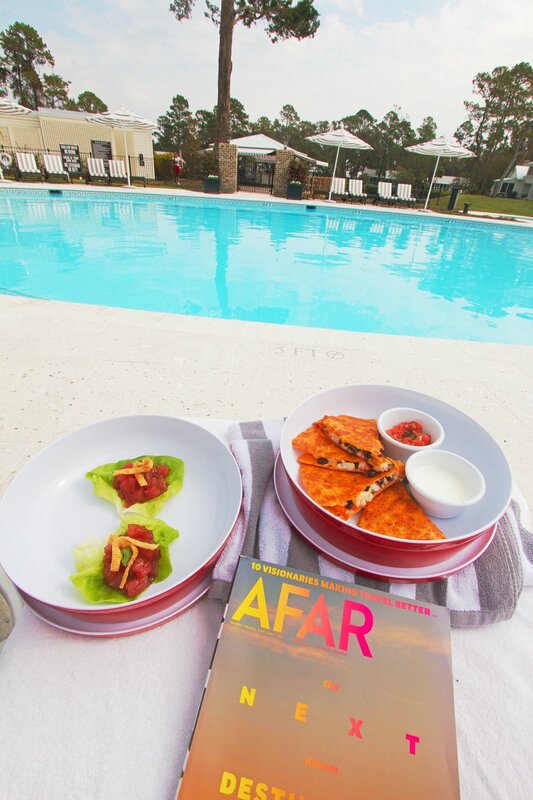 If you'd prefer a more leisurely afternoon, head over to the spa or one of the many pools for lounging around. The service at the pool is really nice and the food and drink selection is surprisingly excellent (especially the quesadillas!). If you're not convinced that The Montage Palmetto Bluff has thought of everything to ensure a perfect stay, then this might just do the trick. Two times a day, the resort's "ambassadors" come out to visit the guests at the Inn. Who are these ambassadors, you ask? None other than the most adorable puppies you ever did meet, there for the sole purpose of licking and snuggling all who come in contact. I am actually completely allergic to dogs, but couldn't help myself from heading over to play every afternoon. Now, these gorgeous pups are probably much bigger by now, so don't expect to see them at this size when you visit. Being from California, I had never heard of porching, but once I figured out what it was, I couldn't go a day without it. Porching is simply a term used in The South to describe a time in the afternoon where you drink and chat with your neighbors. 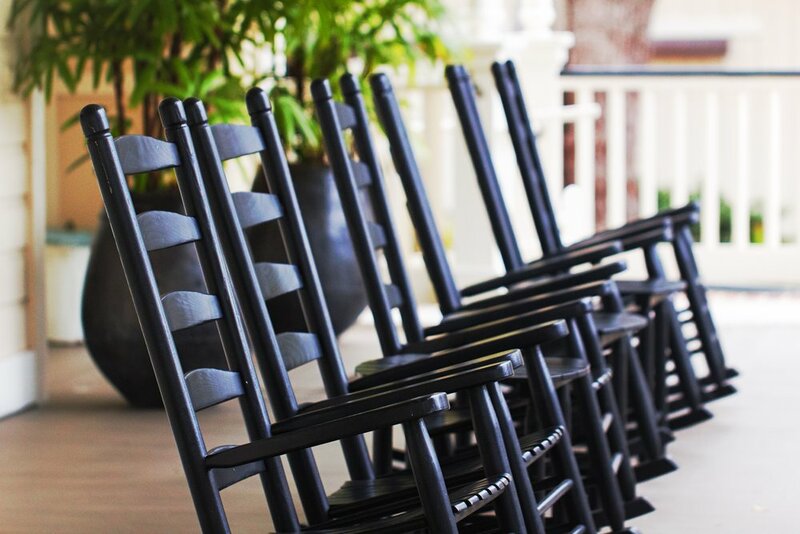 The Montage creates this environment everyday around 3pm at the River House Lounge by putting out some of the best lemonade, sweet tea and freshly baked cookies I've ever had and hoping you mingle with other guests out on the porch. It became one of my favorite parts of the day, where Colin and I could chat about the fun we've had and hear the stories of other travelers. 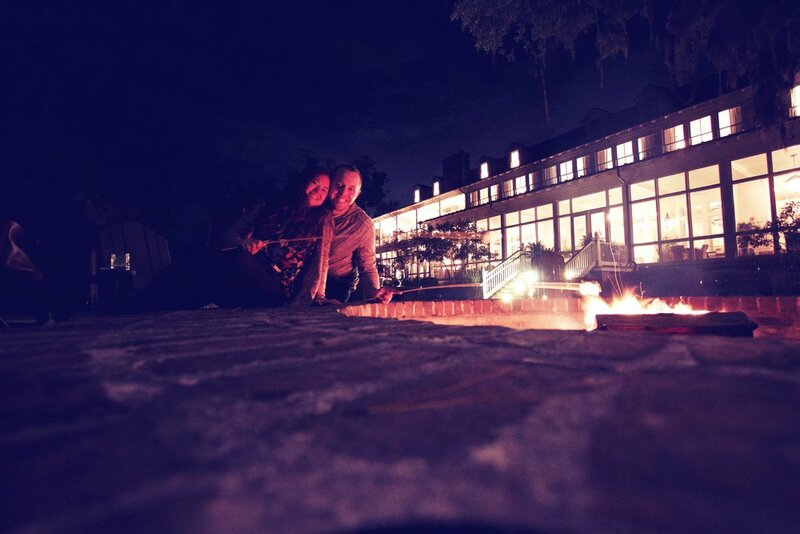 After you get your porching on, you can wander over to the fire pits in front of the Inn where the head chef serves pre-dinner canapés for a nice savory bite to balance out the sugar overload you just finished. Before heading back to our room, of course I like to take my camera out for some sunset shots; the pink and purple clouds are stunning this time of year. Then you probably only have time for a quick nap before freshening up for dinner. This is a tricky one. If you'd prefer not to have to drive, there are several restaurants within the Palmetto Bluff property that are nice, including the high end Canoe Club. In general, as I mentioned before, we were not overly impressed by any of the food, but they were fine options so that we didn't have to drive. Since we were there, at least one new restaurant has opened and possibly more, but no matter what I would highly recommend taking a taxi or driving to downtown Bluffton (about 20 minutes) as I hear there are some very nice restaurants that are worth checking out. 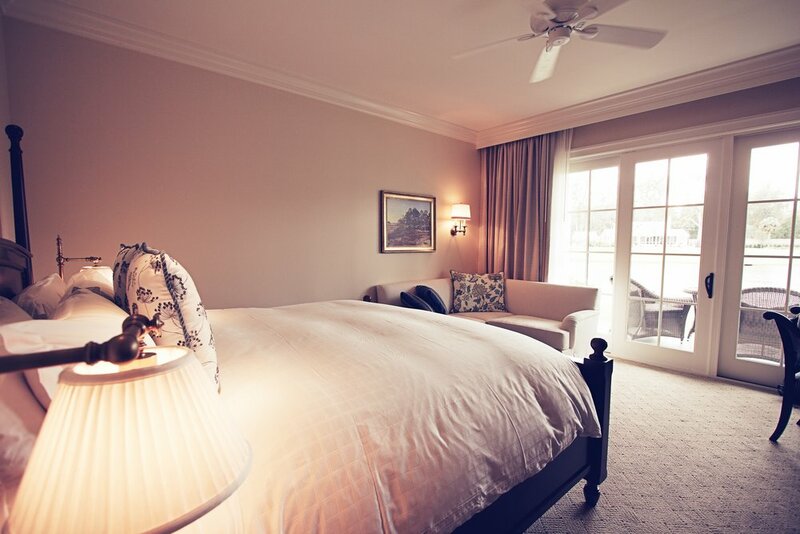 The Montage has truly thought of every detail when it came to providing a perfect stay. 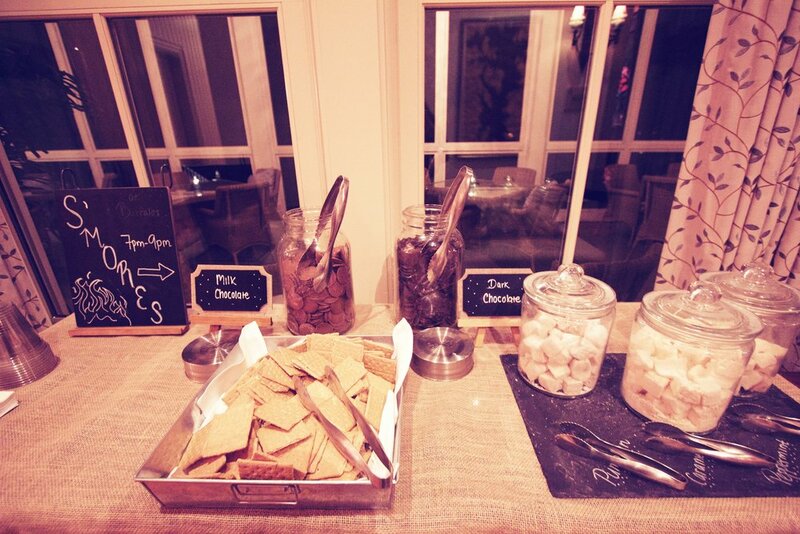 Each evening the River House lights the fire pits and puts out a gourmet spread of homemade, flavored marshmallows, chocolate and graham crackers for your enjoyment. This part of the evening isn't just for the kids at heart, an outdoor bar is also set up so that you can roast your marshmallows over an open flame with your favorite drink in hand. It's luxury adult camp at its finest! That completes my quintessential fall, luxury escape to Montage Palmetto Bluff in South Carolina. This is truly one of The South's greatest hidden gems and shouldn't be missed for a weekend getaway the next time you find yourself in Savannah or Charleston. I'm counting down the days before I return again. Cheers! 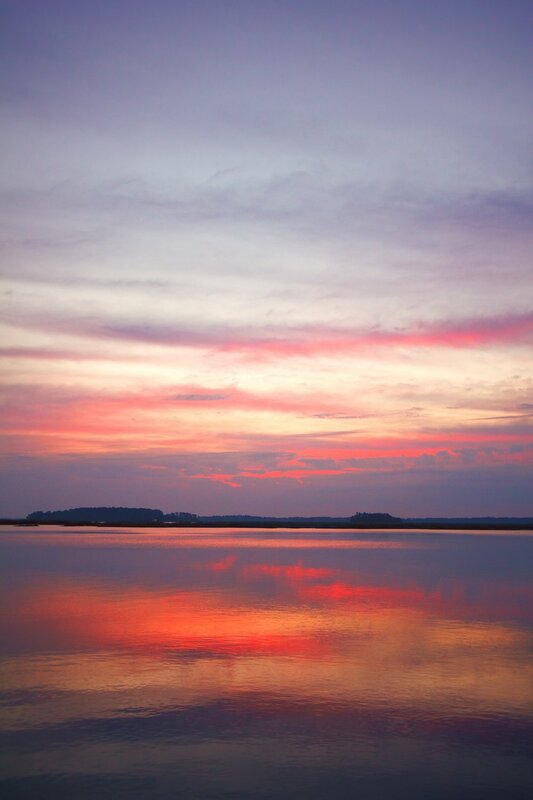 Want even more South Carolina travel tips? Check out my Type A Travel Guide to Charleston, just click below!